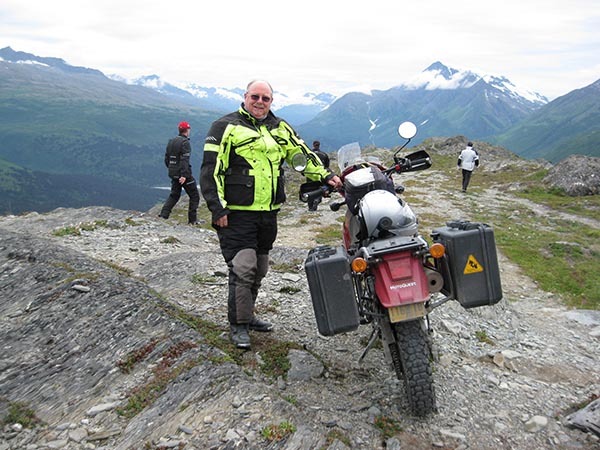 "Kevin Hagerty is a lifelong motorcyclist and a professional guide for MotoQuest Tours in Peru & Alaska. He promotes MotoQuest from his home base in California, and works in Alaska during the summers. Kevin has ridden professionally and is a great mechanic. He has worked in the motorcycle industry as a manufacturer test rider. He shares his quest for adventure with his wife Keleigh, two-up they have journeyed to Alaska, Japan, Peru, Chile, Laos, Ireland, South Africa and all over the Continental United States. One of his stated goals in life is to die experience rich and penniless. His enthusiasm for the sport, experience, and love of adventure make Kevin a great addition to the MotoQuest Team. Teaching and Racing: Kevin has taught land managers across the country to have their first off road experience as a member of the Motorcycle Industry Council's Land Use Task Force. He has worked as a member of Yamaha Motor Corp testing department 1973 thru 1982 and was involved in the development of the very successful Yamaha IT Series in which he was team manager of Yamaha's ISDT Team 1979. He was a member of Yamaha's National Enduro Team capturing the coveted Jack Pine 500 Manufacturers Trophy in 1979. Kevin held District 37 number 5 enduro plate 3 years while running a limited schedule. He has competed in numerous National Enduro's and ISDT 2-day qualifiers over the course of 17 years of competitive off road racing. Above this and even more fun is that Kevin has, for the past five years, been traveling the globe as a MotoQuest guide. " Quote: Economy in the toilet? Go Riding! Favorite Motorcycle Experience: The eight years as a test rider for a major manufacturer. Great pay to play! Languages Spoken: None, unless Hillbilly is a language! Expertise: Kevin is a lifelong motorcyclist, having participated for years in AMA sanctioned off-road competitions, and is as enthusiastic about riding today as he was at age 12. He loves to share adventures with his wife and is committed to spending every dime he has seeing the world on two wheels.